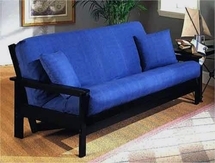 LaurensLinens.com is proud to offer an extensive selection of futon mattress covers for today’s modern futon. The futon is a modern phenomenon of functionality, and because it can be both a seat and a bed, your futon mattress covers need to look great at all times. Our futon slip covers come in a variety of colors and styles, including leopard print and great colors to match any decor, and look great no matter how you’re using your futon at the moment. With colors like Burgundy, red, yellow, purple, and blue you’re sure to match your futon slip covers with your personal style. All of our futon covers are full futon covers—full size and 100% cotton twill "Decorcale Plus." Our futon covers have three sided concealed zippers and fit up to an 8" futon mattress.